Chameleon embodies all of the iconic design elements of Sonus faber while offering a level of customization previously unattainable in this market segment: the entire cabinet is covered in leather; driver flanges are embellished with aluminum trims; the side walls house the exchangeable side panels via a system of pins which allows for their simple removal and replacement. Thanks to this design, choosing the finish is no longer a permanent decision. Instead it becomes something that identifies the speaker, something that can evolve together with customer’s taste. For the Chameleon collection, Sonus faber’s designers have developed cabinet shapes and proportions that aim to control internal resonance and easy integration into rooms. All the driver components are built exclusively for Sonus faber. Other special treatments during assembly put the finishing touches on the drivers before being sent to the production line. 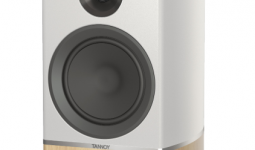 A floor-standing model, a bookshelf speaker, and a centre channel provide a range of combinations that are well-suited to any environment, from the largest living room to the most intimate listening room. Sonus faber Chameleon side panels are available in 6 different finishes: WHITE, BLACK, METAL BLUE, METAL GREY, ORANGE, RED. Midrange 1×150 mm. Free compression basket design and thermo- mouldered polypropylene cone (PP). Ultra dynamic performance and linearity. Sonus faber design. Midwoofer 1×150 mm. Free compression basket design and PP cone. Ultra dynamic performance and linearity.Sonus faber design. 1×150 mm. Free compression basket design and PP cone. Ultra dynamic performance and linearity.Sonus faber design. Woofer 2×180 mm. Free compression basket design and PP cone. Ultra dynamic performance and linearity.Sonus faber design. Passive radiator 1×150 mm. Free compression basket design and PP cone. Sonus faber design.